2. Most important trend shaping the global environment: dramatic expansion of the global middle class. The American economy continues to advance. Over the medium term, “B.C. needs to address a number of important structural weaknesses that threaten our prosperity”. The whole problem with the world is that fools and fanatics are always so certain of themselves, and wiser people are so full of doubt. 3. Historical devaluation of the Ruble triggered significant investment in state of the art sawmilling equipment in Russia. Currency-based advantage led to surge in softwood exports to China. Notion that Russia has an aging, limited infrastructure, is wrong. There are no logistical cost issues in Russia. 5. The panel assembled for the International Markets Review was a rare convention disappointment. U.S. homebuilding constraints are well-known. U.S. housing starts forecasts have become tedious. As for China, when Eric Wong, Canada Wood Beijing Office, warned that B.C. is losing softwood market share, no alarm bells sounded at the Vancouver Convention Centre. Growth in demand offshore is “continual” according to Wong, attributed in part to logging bans in China’s “natural forests” (25 million cube/year harvest reduction). Record softwood imports in 2016 in China >32 million cubes. In a post-beetle world, at least one trader was left wondering if B.C. (“the global resource for softwood,” according to architect Michael Green) should just go off the market. 6. India will be the 5th largest consumer market by 2025. 60% of the population in India is <35. 7. “The concept of innovation is.. what are you going to do with all of this growing information? Big Data connects people, like us, to the brilliance in the room”. Challenges facing the Big Data Revolution: Volume, Velocity, Variety, Veracity. 9. How can we keep better track of our natural resources using emerging technologies? We need better data and better analysis tools. 15. TOE = Timber Online Education. Open access to leading experts.. “from forest to frame”. Free global education in wood design, construction, policy, markets, ownership, and environmental impact. – Lyn Hall, Mayor, City of Prince George, who confirmed the COFI Convention returns to PG next year. 26. Q: Is a market share-based quota inevitable? 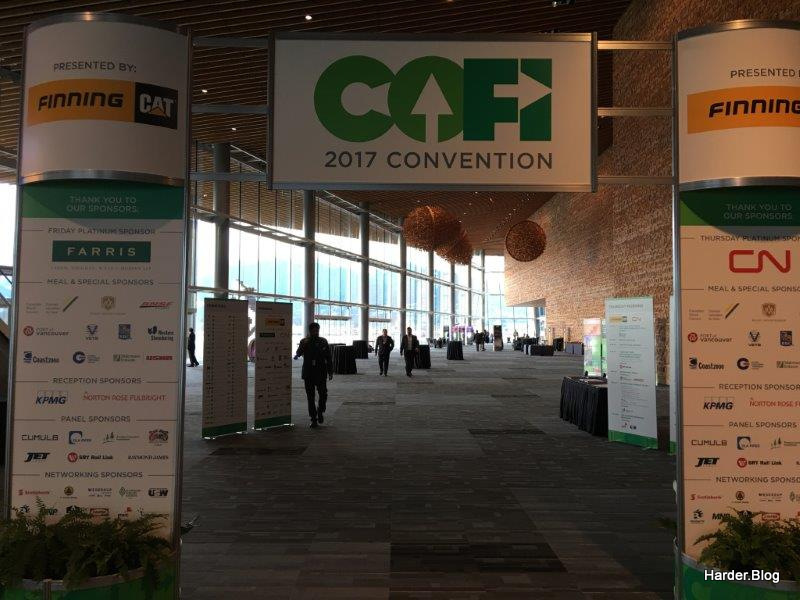 The sold out COFI 2017 Convention kicks off at 6:30pm this evening with an ice breaker in the stunning wood-infused architecture of the Vancouver Convention Centre. 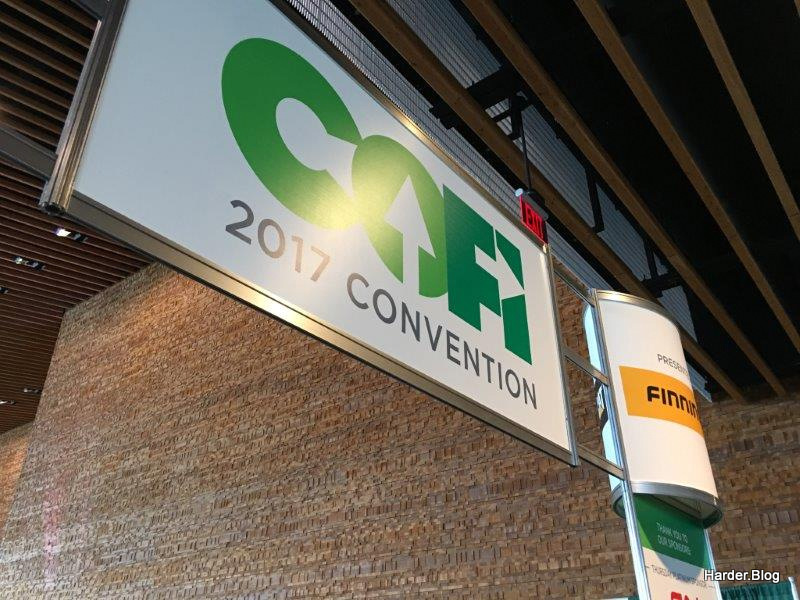 The largest gathering of the forest sector in Canada, we’re told over 600 delegates are registered this year, making this the biggest COFI Convention in ten years. 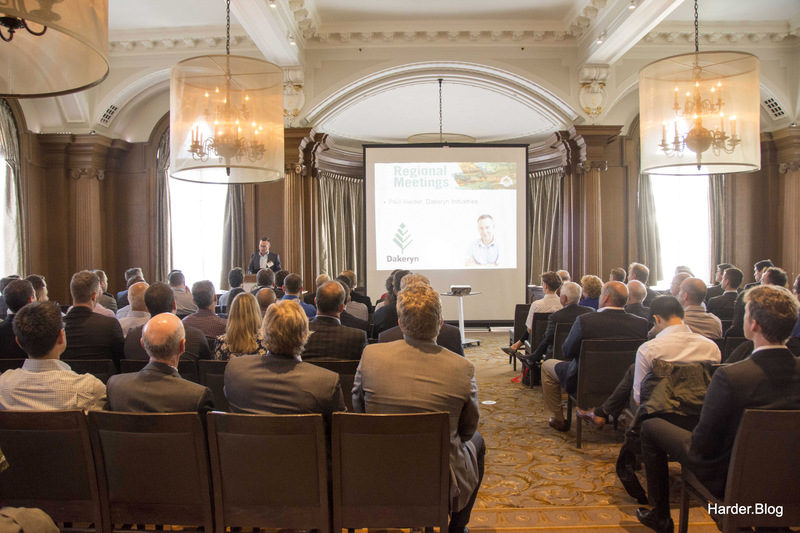 The annual meeting brings attention and awareness to the significance of forestry to the economic well-being of the province. This year’s theme is Forestry for the Planet. Forest Products for the World. The convention’s jam-packed itinerary ensures plenty to capture our attention through Friday. Tomorrow’s keynote speaker is renowned architect Michael Green who will present Increments of Change: from early tall wood buildings to a global movement. I’m also looking forward to the International Markets Review in the morning, and an afternoon CEO panel featuring Nick Arkle (Gorman Group), Duncan Davies (Interfor), Don Kayne (Canfor), and Ted Seraphim (West Fraser). On Friday, David Emerson, BC Trade Envoy to the United States, will discuss Canada’s Trade Negotiations Agenda with Kirsten Hillman, Assistant Deputy Minister, Trade Policy & Negotiation, Global Affairs Canada. There’s a ton of other interesting panel discussions before we hear from BC Premier Christy Clark, keynote speaker at Friday’s closing luncheon. Speaking of politics, it’s interesting today to look back in the blog archives at Premier Clark’s keynote at the COFI 2013 Convention, a fiery speech which seemingly sparked her campaign’s comeback, leading to a surprise victory in the provincial election the following month. 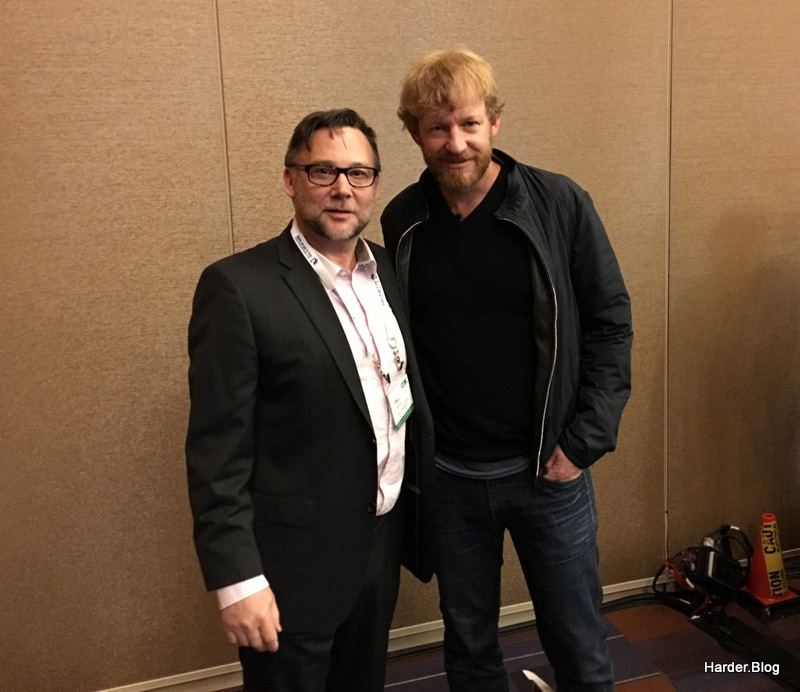 A good preview of the COFI 2017 Convention is available in the podcast below. It includes a number of hard-hitting caller questions for Susan Yurkovich, COFI President & CEO. My 23 takeaways from last year’s excellent COFI Convention in Kelowna are available here.